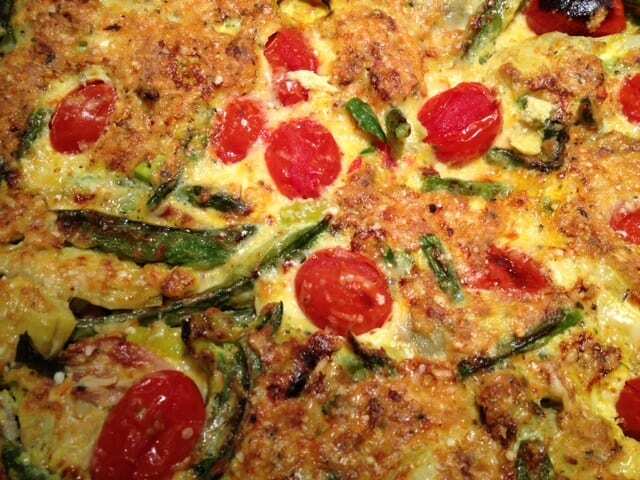 My Spring Vegetable Frittata is a simple vegetable forward egg entrée full of flavor and fiber rich nutrition! My Spring Vegetable Frittata is brimming with late Winter and early Spring organic vegetables then married with healthy farm raised eggs, delicious Parmesan Reggiano cheese and light Panko breadcrumbs! My Spring Vegetable Frittata, with an abundance of artichoke hearts, fresh organic asparagus,organic leeks, pasillo pepper, whole organic pea pods and just a bit of Canadian bacon(optional), is seasoned with the tastes of Italy, garlic and Aleppo pepper flakes and topped with tiny organic grape tomatoes! My Spring Vegetable Frittata is a perfect meal for the season; a light entrée that is delicious and nutritious! Add a crisp fresh salad and a light white wine, just yummy!! !